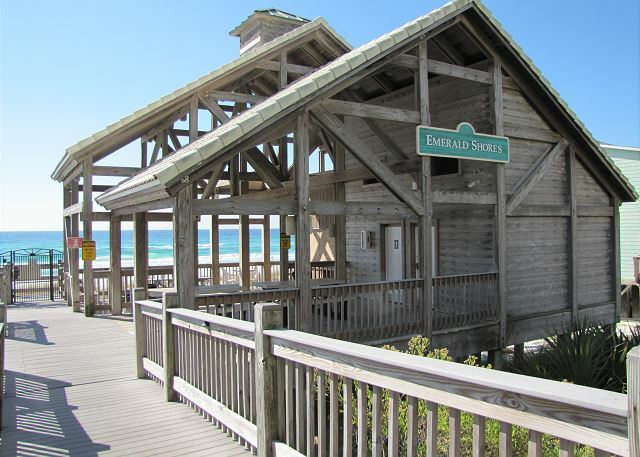 Destin Vacation Rental in Emerald Shores! Large 3BR/3BA Caribbean style cottage with loft & bonus room! Walk to the beach and pools! Sleeps 11! 3 stories with covered porches and wrap around balconies. You'll love the balconies! Big and spacious rooms! Large living room open to the dining room and kitchen. 40' Flatscreen LCD TV with High Definition channels! FREE Wireless high speed internet is provided! Clean dogs may be welcome! They must be approved in advance and require an extra fee. Please let us know if you are bringing a dog. 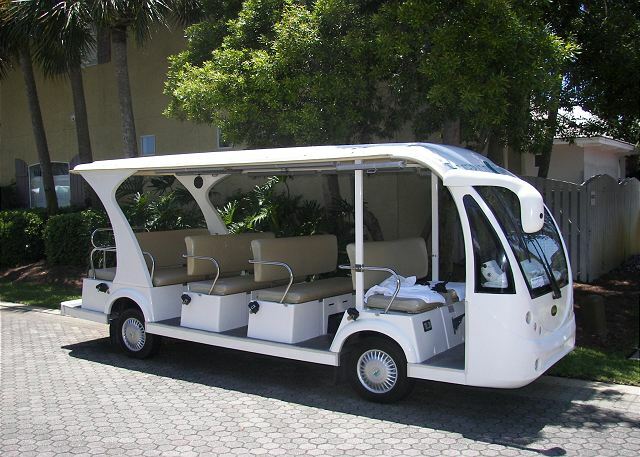 We have a wagon that you may take to the beach with you! 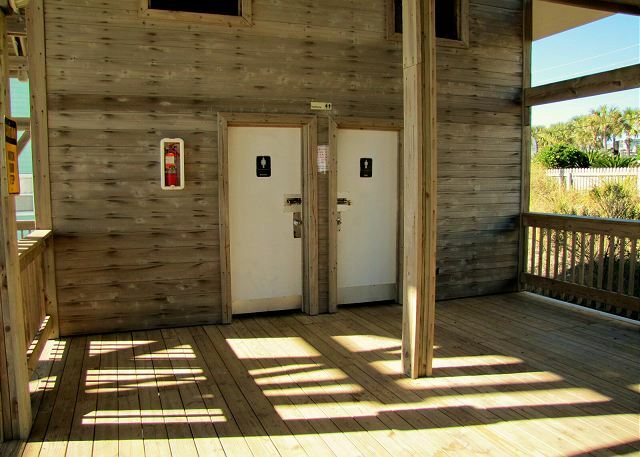 This makes it easier for you to take beach chairs, coolers, and even small children to the beach! Nice backyard with privacy fence, patio, and BBQ grill. Upstairs, you'll find 3 bedrooms, a bonus room, and a loft on the 3rd floor with a wet bar and a balcony! 2nd floor balcony accessible from bonus room and master bedroom. 1 King, 1 queen, 2 twin beds in the bedrooms. Sleeper sofa in living room and bonus room. Sleeper chair in the 3rd floor loft. Make wonderful memories at Helgoland! The beach is about 2/10 of a mile, short 5 minute walk! There is also tram service during the summer. There are 2 pools, a tennis court, basketball goal, shuffle board, and a private beach Pavilion with lounge chairs, picnic tables, and restrooms. Beach service is available at the beach for a fee! 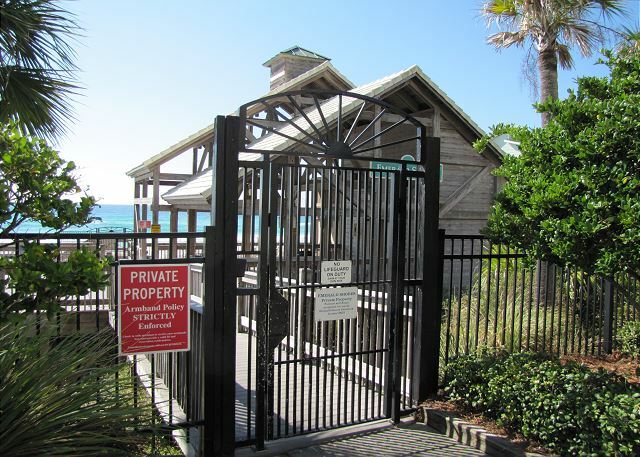 Emerald Shores is a gated community located at the county line just off Scenic Gulf Drive. 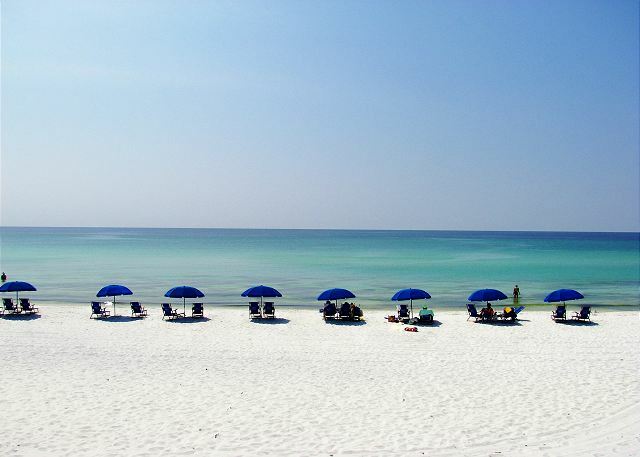 We are 2 miles east of the Destin Commons Mall and 2 miles west of the Silver Sands Designer Outlet Mall. 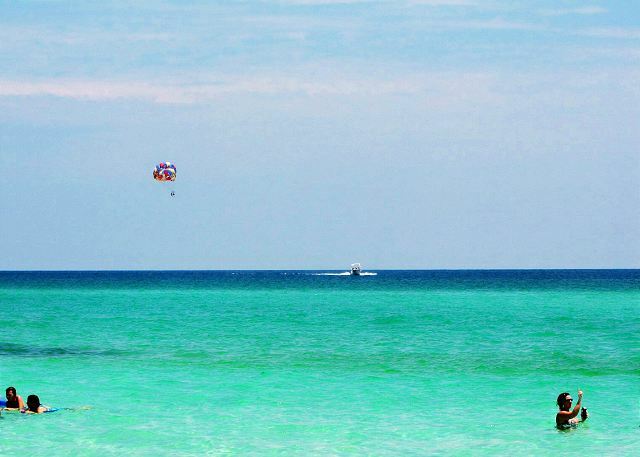 Walk to restaurants like Kenny D's and Captain Daves on the Gulf! All shopping, water sports, restaurants, golf courses, and bars are close! Great rates make this one hard to pass up! The house was great! Beautiful neighborhood, safe, quiet. The beach next to it is gorgeous and a 2 minute walk. We loved it. The company was helpful and informative we had no issues at all. We are definitely going back. Hello Nisreen, Happy to hear your group (and Teddy) enjoyed your stay at Helgoland and will be returning. We love our repeat guests! See you soon. Helgoland is less than a five minute walk to the beach. We loved the house! What a great Thanksgiving Break with our family!! We were so pleased with our property at Emerald Shores. 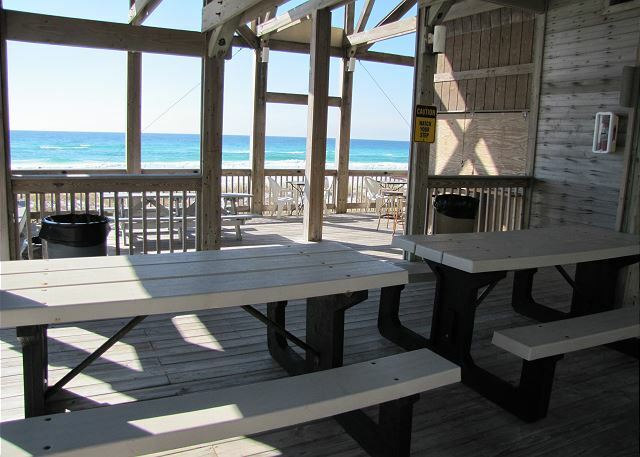 Hello Cox Family, We're happy to hear you enjoyed your Thanksgiving at the beach! We hope you'll come back and stay again next year! Hi Fernando, We look forward to your next stay with us! Glad you had a great time. The house was very nice and within walking distance to the beach. We walked the beach every morning with our dog (who absolutely loved the top balcony watching everything). Kids spent hours at the beach, we went fishing on the Okaloosa Pier which we saw dolphins, baby shark, stingray, jellyfish it was awesome. Went sailing on AJ's sailboat and saw more dolphins, had an awesome time. The only negative was we thought the main king bed was not very comfortable, but other than that everything was great. It was a great experience our family has stayed here the same the week the last 2 years and we love it . It could use a few upgrades compared to the other similar properties . Tv in master def needs a update but its a great house. We had a great time. We have been to Emerald Shores each of the last 10 years and this was our first time in this house. The layout of the house was great and there was adequate space. There were a couple of negatives. A tiny television in the master bedroom was hard to see. Also the wifi was not really good since the router was on the 3rd floor. Really bad connectivity. And the grill was in bad shape and not functional. I like to grill when we're in Destin, but not this time. Other than that, everything else was and we will continue coming to Emerald Shores. Was in a perfect location, easy access to the pool and the beach. Beautiful house. Only downside we had for the three weeks was very slow internet, they really need high speed. So glad you enjoyed your stay at Helgoland. It is a super nice home with nice upgrades. Recently painted too! Will check the internet. There should be a range extender there too. Maybe it wasn't working properly at the time. So glad you enjoyed your stay at Helgoland! It has been updated nicely with fresh paint throughout! Great location and a private backyard! Had a great time in Destin! And the house is within walking distance to the beach. Short drive to great shopping, and oh my goodness the seafood was wonderful! So glad you enjoyed Helgoland. 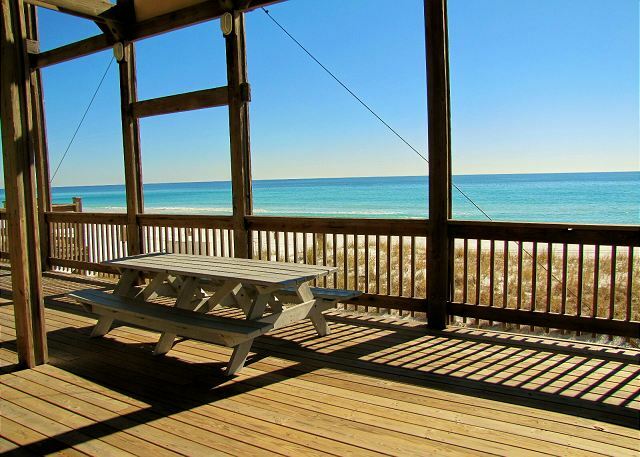 It is a nice home very close to the beach and all Destin activities. The inside is being painted this week! of 8 or more, we had plenty enough room for everyone in our party, including our 4 dogs. So glad you enjoyed your stay at Helgoland! It is a spacious home with nice balconies and a private, fenced back yard! 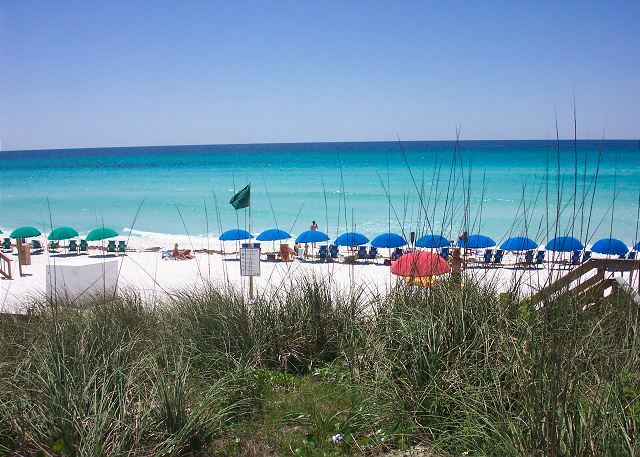 Close to the beach and all activities in Destin too! The property was in a beautiful neighborhood with nice amenities. We did not like the umbrella service taking up all the first and second row positions and then felt as if we had to rent from the company for a spot at the "private beach". We ended up going to the public beach! Also, the home was not very clean and the master bedroom bed was TERRIBLE. It needs replacing. Overall, our vacation was very nice and Crystal Waters was wonderful to work with but I would check up on the cleaning company. We had a great time at Helgoland! So glad you enjoyed your stay at Helgoland! It is a nice 3BR/3BA home so close to the beach in a gated neighborhood! the property was gorgeous! great restaurants nearby. the beach is a 5 to 10min walk! really loved the top porch, has a great view! has an ample amount of space! So glad you enjoyed your stay at Helgoland! It is a great house in the best vacation neighborhood along our stretch of beach! The private beach cabana is less than 1/4 mile, maybe a 4 to 5 minute walk for most people! The cabana is private and codes are needed to go onto and up from the beach! There are also 2 pools and a tennis court! Helgoland was a good place to stay! Great location and in a nice, clean community. It was a very spacious place and had lots of room. Very nice beach access and not a very long walk to the beach. I was disappointed though in some things. This place needs updating. Some of the furniture was very "used" and it was noticeable. Also, pots and pans in the kitchen need to be replaced bad. They are very worn. Dishwasher leaked and it was reported. Towels in the bathroom...there was only bath towels and hand towels. The washer and dryer was up to par...very nice. This is not a bad place to stay, but I just feel that it needs updating and needs some TLC in the decorating department. So glad you enjoyed your stay at Helgoland. It is a big 3 story house with lots of room. The pots and pans have been replaced! Thank you for bringing that to our attention. We do provide bath towels, hand towels, and wash cloths. It is too difficult to provide beach and pool towels. The washer and dryer are new and the dishwasher is about a year old. We stayed for a long weekend (Wed - Sun) during spring break. It was a very nice get away. House and location is perfect! Just a couple steps to the beach. Nice privat beach are with food, drinks and restrooms. Would come every time again. No complains. Very quiet neigbourhood. Loved it! So glad you enjoyed your stay at Helgoland! It is a nice home very close to the beach with the best amenities along this stretch of beach! The home was great. Location was perfect. Our family enjoyed it very much. Check out was at 9am and we had to return the wristbands at 10am to the cabana. We left at 9am like the document said and had to kill an hour before heading back to cabana. Once I got to the cabana, the lady was extremely rude. Other than that Leah was awesome. So glad you enjoyed our home, Helgoland. 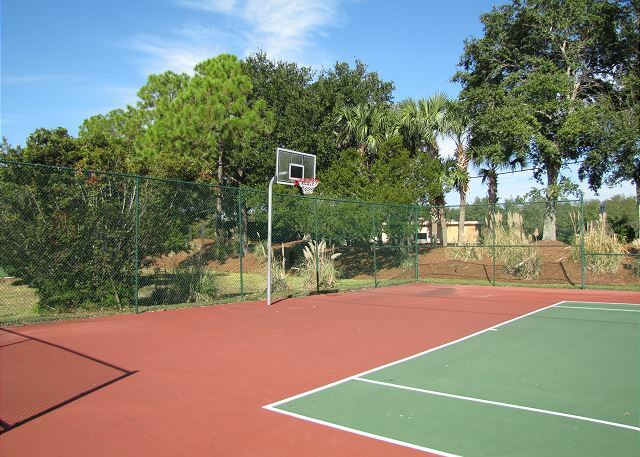 It is a nice home in a gated neighborhood with nice amenities and close to everything in Destin. The wrist band policy is for the neighborhood amenities and will be tweaked very soon. Spring Break was the first time it was implemented and lessons were learned! Wonderful week for Spring Break!! Far enough away from the crowds and noise, but close enough to enjoy PCB too!!! Loved the shopping areas around our area as well. Overall had a very nice time and would recommend to friends and family. Glad you enjoyed your stay at Helgoland! 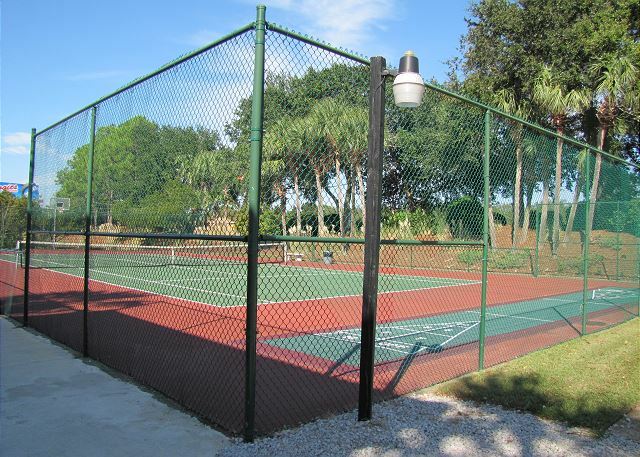 It is a nice home in a gated, secluded neighborhood but close enough to all activities! The folks at Crystal Waters made it easy to rent this fun home in the heart of everything! Close to the beach, restaurants and shopping! The house has plenty of room, but compared to some of the others in the same neighborhood it's furnishing needs updating and the carpet on the stairway needs to be deepcleaned, Kitchen is cheaply done.